So, what is it that makes the Masterbuilt Front Controller the best smoker? Let’s find out more about its exclusive features and benefits. This smoker comes with 4 chrome-coated smoking racks that can smoke up to 100 pounds of food. The 20075315 smoker has a thermostat integrated in its body for controlling temperature while cooking. It features an in-built meat probe thermometer to provide the perfectly smoked meat every time it is used. The front control panel comes in a design that allows extra space for prepping on the smoker’s top portion. It features adjustable door latch to retain smoke and heat. Improved Insulation- It offers better insulation when compared to other smokers. Better Viewing- You can use the LED lights mounted on this smoker to monitor your food in a better way. RF Advantage- The radio frequency remote feature of this system ensures hassle-free smoking. Easy Maintenance- The smoker is conveniently-sized and mobile. Also, cleaning the smoker is no trouble at all. 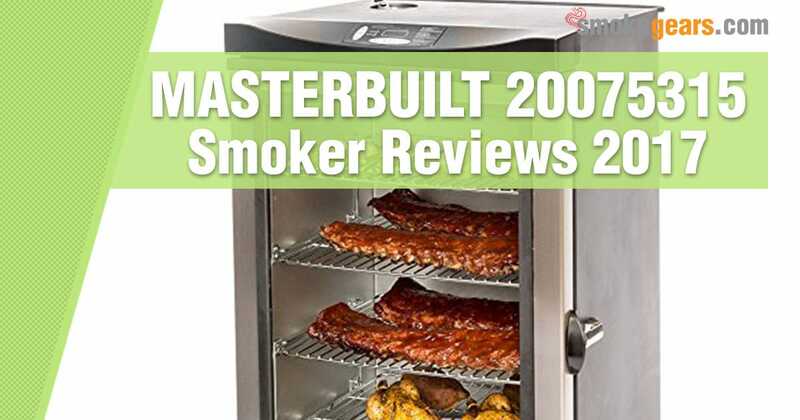 The 20075315 smoker is perfect for both amateurs and pros. You can widen your culinary skills in smoking meat using this system. It can also be a huge relief for those who party regularly. This domestic help will impress your guests whenever you organize any celebration. With very little space to occupy, the Masterbuilt is great for any house. When I received this smoker, I assembled it in no time; assembly was very easy and convenient. It comes with wheels so there’s no problem in moving it around. The door comes with adjustable latch that can be tightened to keep the smoke from escaping. The light is on the outer-side of the smoker, which reflects off the smoker’s glass when its door remains closed. The internal racks can be adjusted and the in-built meat thermometer works accurately. I use soapy water to scrub up the smoker and it cleans up pretty good. You don’t have to leave your sofa with the remote in your hand. The chip tray also works easily. And I have received loads of compliments over the last year for my smoked meat preparations. It can be stored and cleaned easily. The remote control makes its operations simpler and easier. The blue LED light feature is amazing. It is perfect for smoking meats. The body of this smoker is made from top quality stainless steel. It is spacious and can be assembled without any hassle. It is both affordable and durable. The flavors hold well in this smoker. The sturdy parts of the smoker make it safe and convenient to use. It retains smoke and heat properly and insulates pretty well. There are certain limitations of this smoker. Some users have experienced issues related to cut offs and power shortage. This is simply because they have been shipped defective products. That is why you should check its warranty and get in touch with the online store in case of any such problem. You may need more time to assemble that mentioned in the booklet. There are some who can assemble this smoker within 15 minutes and some who take longer than that. What you need to make sure is that the smoker is installed properly before using it. Make sure that you check all the parts prior to assembling the smoker. Sometimes broken or damaged parts are shipped, which need immediate replacing. Don’t forget to clean all the racks prior to getting started with your smoking. Also, ensure that you have adjusted them properly to your smoker. It is important to clean up the smoker after and before using it. Don’t ever overload the racks because they might collapse during use. Check the smoker capacity before you use it for smoking meat. Be careful while moving the smoker. Avoid bumps so that your system doesn’t get damaged in any way. Don’t move your smoker while using it. It can be dangerous. Don’t allow kids near your smoker when using it; you need to avert accidents in every possible way. It is highly paying to invest in a smoker. You can explore your skills in cooking with a smoker at home. Instead of heading out for food joints or restaurants, you can enjoy meat at your home! Having knowledge about using a smoker and taking care of the unit can ensure its proper functioning for a lifetime. Investing in the 20075315 is worth every penny. It is long-lasting and dependable. You don’t have to worry about any safety issues when you own a Masterbuilt 20075315. And most definitely, the best part is that you can smoke meat perfectly using this smoker. With advanced features like RF remote and LED lights, this smoker can make your holidays and parties unforgettable!